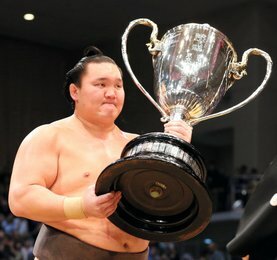 Hakuho continue sa route vers un 42ème titre en décrochant sa septième victoire en battant Shodai. Après deux combats plus difficiles que prévu, le grand champion mongol a démontré sa supériorité en dominant le maegashira 3 sans victoire en quelques secondes. 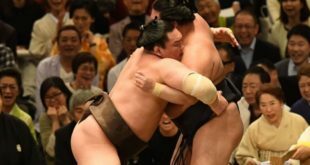 Lors du dernier combat de la journée, Hakuho s’est imposé face à Shodai à l’aide d’une combinaison de gifles et de coups, puis l’a envoyé à terre. 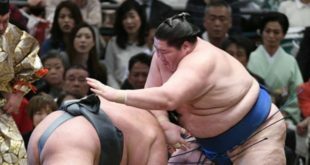 A la septième journée, Hakuho partage la tête avec son compatriote Ichinojo. Ichinojo a poursuivi sur sa lancée impressionnante avec une victoire décisive sur Abi. 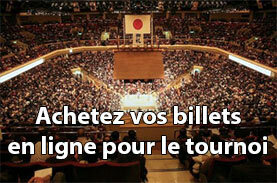 Cinq lutteurs sont avec une seule défaite (6-1) : Kakuryu, Takayasu, Goeido, Kotoshogiku et Aoiyama. Kakuryu a remporté sa sixième victoire d’affilée en surmontant les vifs efforts de Nishikigi. Goeido (6-1) a rebondi après sa première défaite avec une victoire décisive sur le komusubi Mitakeumi (3-4). L’ozeki natif d’Osaka a commencé par une grosse gifle, puis a obtenu une double prise qui lui a permis de repousser Mitakeumi vers le bord avant de le pousser par derrière. 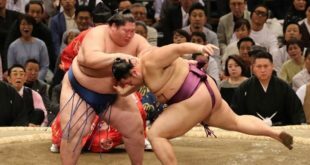 Takayasu (6-1) a conservé son avantage en sortant le komusubi Hokutofuji (2-5). Le sekiwake Takakeisho est resté dans la course pour sa promotion en surmontant Daieisho. Takakeisho (5-2) a débuté avec son attaque habituelle et a rapidement dominé Daieisho (3-4), le faisant passer par-dessus la limite du cercle. 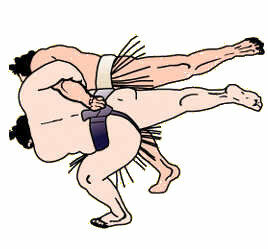 L’ôzeki Tochinoshin (4-3) a essuyé un échec avec une défaite face à Endo (2-5). Le sekiwake Tamawashi, vainqueur du grand tournoi de janvier, a amélioré à 4-3 son score en battant le Brésilien Kaisei (0-7). Aoiyama et le vétéran Kotoshogiku ont tous deux remporté des victoires lors de la septième journée. 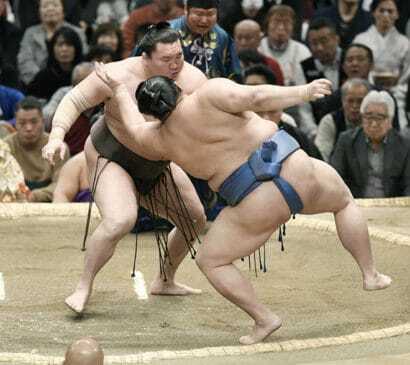 Yokozuna Hakuho continued his march toward a record-extending 42nd championship at the Spring Grand Sumo Tournament on Saturday, improving to a perfect 7-0 by beating Shodai. After a pair of tougher-than-expected bouts against rank-and-filers, the Mongolian grand champion showcased his phenomenal power on Day 7 at Edion Arena Osaka by dispatching the winless No. 3 maegashira in a matter of seconds. 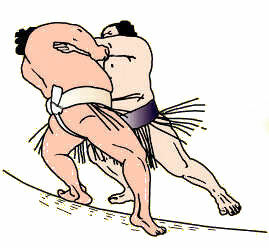 In the final bout of the day, Hakuho sent Shodai backpedaling with a combination of slaps and shoves, then toppled him from the raised ring with a forearm shove. 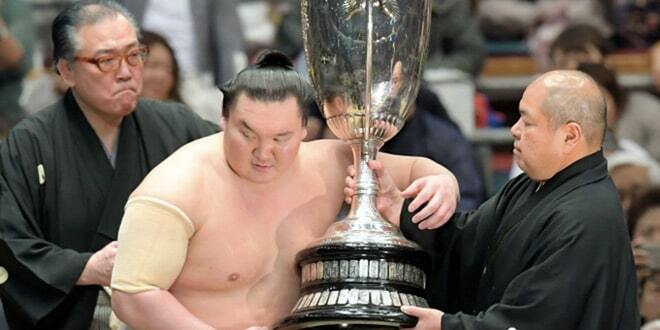 With seven days of the 15-day tournament completed, he shares the lead with his 226-kilogram compatriot Ichinojo. The biggest man in the division, No. 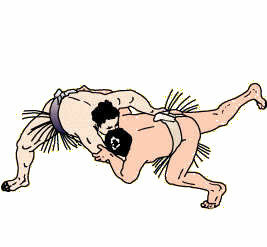 4 Ichinojo continued his impressive run with a thrust-down victory over No. 6 Abi. 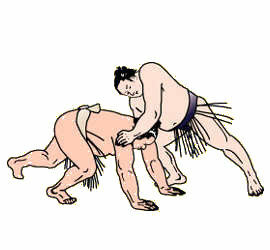 Abi (2-5) battered Ichinojo with a flurry of thrusts to the upper body, but he was unable to budge the giant Mongolian, who easily slung the smaller wrestler to the clay. Five wrestlers are one win behind the leaders at 6-1 — yokozuna Kakuryu, ozeki Takayasu, ozeki Goeido, as well as rank-and-file wrestlers Kotoshogiku and Aoiyama. Mongolian grand champion Kakuryu reeled off his sixth straight victory, overcoming a spirited effort by No. 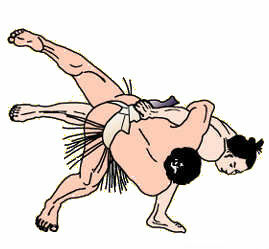 3 Nishikigi to win by slap-down. 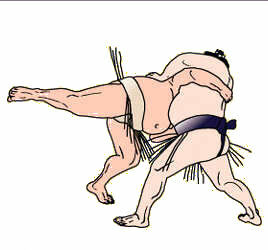 Kakuryu caught Nishikigi off balance at the jump, shoving him from behind, but the lower-ranked wrestler recovered to mount a spirited attack. 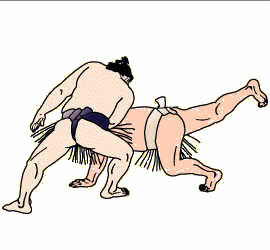 As the pair exchanged blows in the center, the grand champion risked slipping to the clay before steadying himself and slapping his winless opponent down. Local favorite Goeido (6-1) bounced back from his first loss on Day 6 with a decisive win over komusubi Mitakeumi (3-4). 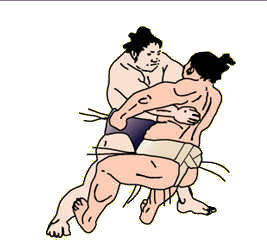 The Osaka-born ozeki opened with a hard face-slap, then took a double inside grip that let him shift Mitakeumi to the edge before shoving him out from behind. 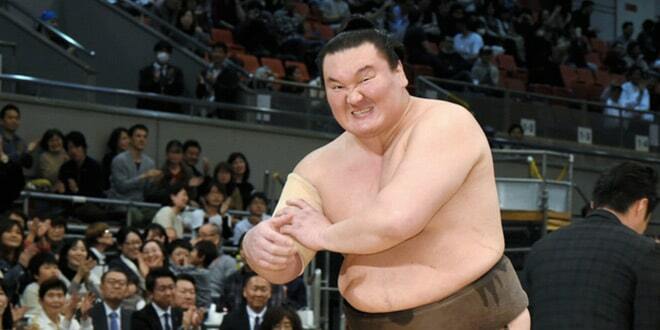 Takayasu (6-1) stayed one win off the pace but looked a little lackadaisical before pushing out komusubi Hokutofuji (2-5). Sekiwake Takakeisho stayed in the hunt for a second championship and improved his chances of promotion to ozeki by blowing away No. 2 Daieisho. 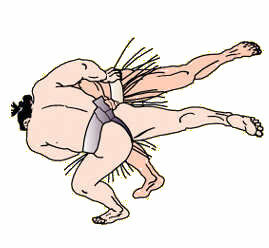 Takakeisho (5-2) opened with his customary thrusting attack and quickly overwhelmed Daieisho (3-4), driving him over the straw. 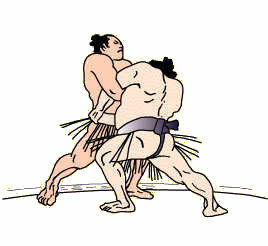 Ozeki Tochinoshin (4-3) suffered a setback in his bid to avoid demotion with a loss to No. 1 Endo (2-5). 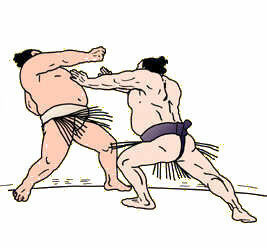 The injury-hampered Georgian succumbed to a belt hold after giving Endo a hard slap at the opening. 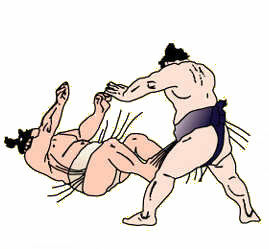 Endo then maneuvered Tochinoshin, who needs a winning record to keep his ozeki status, to the edge and out. Mongolian sekiwake Tamawashi, winner of the January grand tournament, climbed to 4-3 by beating Brazilian No. 1 Kaisei (0-7). 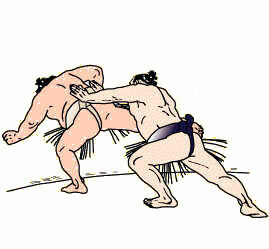 Kaisei opened strongly, but Tamawashi drove him back with a thrusting attack to the throat. Kaisei looked for a hold as he backpedaled, but Tamawashi pushed the Brazilian maegashira out before he could gain a grip. Bulgarian-born No. 7 Aoiyama and veteran No. 8 Kotoshogiku both registered victories on Day 7 to stay one win back from the leaders.